Low Cholesterol Accompaniments, Low Cholesterol Indian Side Dishes. Accompaniments are termed as additions to the main meal or snacks. But they play a vital role in enhancing the overall look, appeal and flavor the dish. Here, in this section you will find a variety of accompaniments to suit your needs for different meal times. While bread is to be restricted, as an occasional treat you can try Parsley Yogurt Spread instead of cholesterol rich butter on a slice of whole wheat bread. 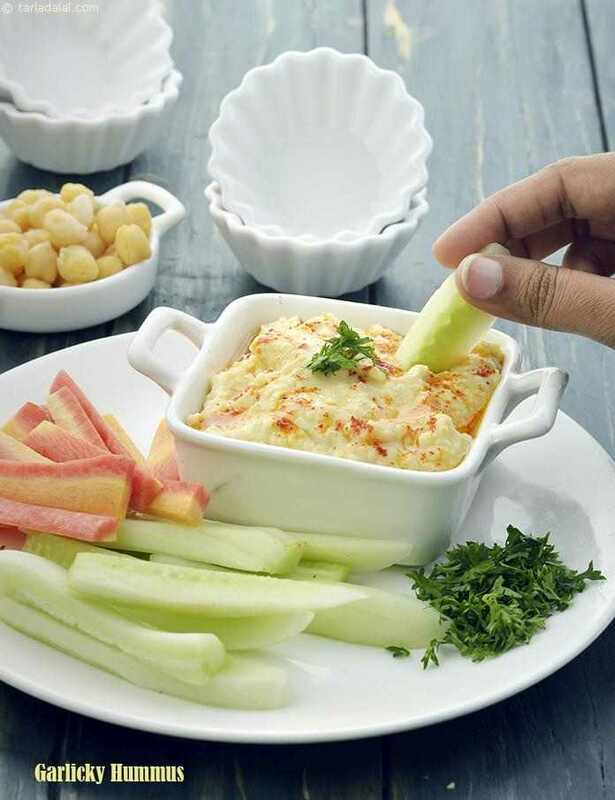 If you are looking for some kinds of dips to be enjoyed with high fiber veggies like carrot and cucumber, do not miss out on Garlicky Hummus, Green Tomato Salsa and Eggplant Dip . As an accompaniment to snacks we have created healthy version of chutney i.e. High Fiber Chutney and Garlic Tomato Chutney, which are sure to please your taste buds. And if you are an avid pickle fan, try fiber rich Crunchy Vegetable Pickle. Hope you enjoy all these Low Cholesterol Accompaniments, Low Cholesterol Indian Side Dishes and other low cholesterol articles below. The inclusion of this chutney may come as a surprise to some. The fibre in this chutney comes from green peas, which are added to the coriander. Garlic, lemon and as little as 1 teaspoon of sugar are added to perk up its flavours. A unique twist has been given to the simple garlic chutney by adding tomatoes and spring onions to it. Tomato gives it the much needed tang, while the coriander and spring onion greens add to the crunch and earthy flavour. This chutney compliments mint and masoor rolls and whole wheat salad wrap.